Today’s “Card of the Day” features a Wave support card with two guns! 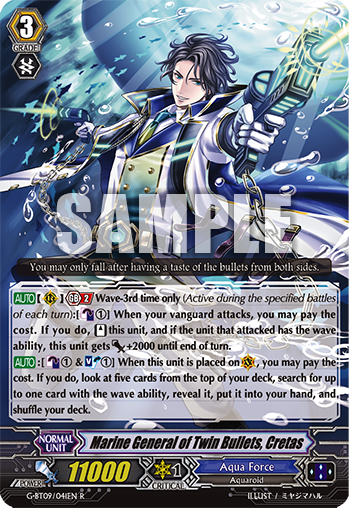 [AUTO](RC)[Generation Break 2] Wave-3rd time only (Active during the specified battles of each turn):[Counter-Blast 1] When your vanguard attacks, you may pay the cost. If you do, [Stand] this unit, and if the unit that attacked has the wave ability, this unit gets [Power] +2000 until end of turn. [AUTO]:[Counter-Blast 1 & Soul-Blast 1] When this unit is placed on (VC), you may pay the cost. If you do, look at five cards from the top of your deck, search for up to one card with the wave ability, reveal it, put it into your hand, and shuffle your deck.